Stems: Erect, wand-like, simple or sometimes branched above base, densely short-hairy below. Leaves: Alternate, mostly egg-shaped to elliptic or oblanceolate, less often lanceolate, 3/5 to 4 inches long, 1/5 to 1 inch wide, reduced upward, glabrous to hairy or minutely pubescent; tips pointed, rounded or blunt; margins entire to irregularly toothed, often fringed; short-stalked to slightly clasping. Inflorescences: Raceme, loose to moderately dense, 2 to 16 inches long, terminal; 1-2 flowers per node; bracts lanceolate to awl-shaped, 1/5 to 3/5 inch long. Flowers: 1/3 to 1/2 inch long; calyces bell-shaped, 1/5 to 2/5 inch long, glabrous to rough or minutely pubescent; lobes awl-shaped to linear-lanceolate, slightly spreading, margins entire or with 1-2 large teeth per side, often fringed; corollas usually pale blue, sometimes darker, 1/6 to 2/5 inch long, 5-lobed; lower lobes 3, ovate, slightly reflexed, glabrous except for pubescence at base of lower lip within; upper lobes 2, lanceolate, curving upward, slightly shorter than lower lobes. Fruits: Capsule, nearly spherical, to 1/5 inch in diameter; seeds numerous, minute, egg-shaped, chestnut-brown. Habitat: Native prairies and meadows, occasionally open woods; moist soil. Distribution: East 1/4 of Kansas. Uses: Native Americans used a cold infusion of the roots to treat arm trembles and a tea of the stems as a wash for neck and jaw sores. 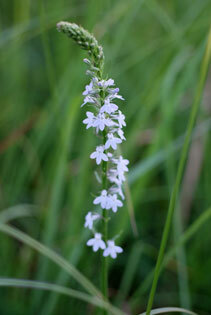 Comments: Lobelia spicata is a highly variable species.